Welcome back to the third installment of my new “Fall and Film” series. As before, this installment looks at a number of films in various horror sub-genres that I enjoy watching in October as the autumn season comes creeping in and we draw ever closer to Halloween. Cop out! Two?! Yes that is correct, this category is a tie. In my defense, it is the only tie on this list. Because this series anticipates the arrival of Halloween, a good ghost movie is necessary and frankly, there were too many good ghost movies to choose from. 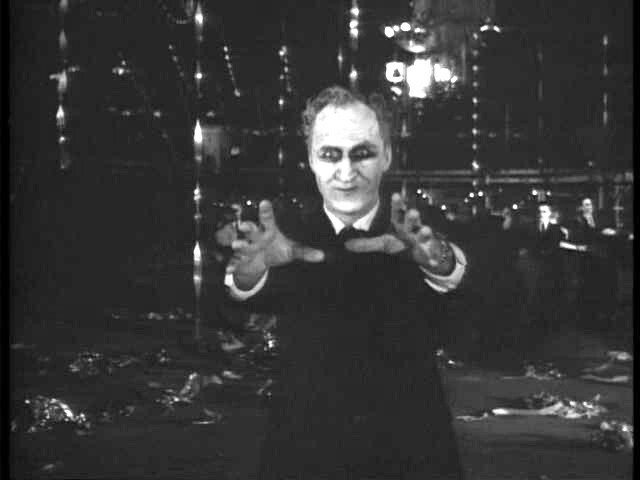 First, let us analyze Carnival of Souls. This is a creepy little number, directed by the late Herk Harvey, and was released in 1962 as a low budget, B-horror film. From what I gather, the film did not do very well and was essentially forgotten, until it was re-discovered some years later and is now listed as a “cult classic” (whatever that means) by some groups and websites. The film centers on a young church organist named Mary, played by Candace Hilligoss, as she moves to Utah to take a new position at a church. Problems abound as a group of ghosts, seemingly led by one man, continues to follow Candace, causing her life to spin into turmoil. Ghostly apparitions, chilling organ music, and minimal, yet effectively scary, makeup make this a must see. My tie pick for this year’s ghost story movie is the more well known The Fog, starring Adrienne Barbeau and Jamie Lee Curtis, directed by John Carpenter from 1980. Although seemingly overshadowed by Carpenter’s tour-de-force, Halloween, The Fog is a wonderfully made, creepy little movie. The story involves a small coastal town with a dark past… one that includes purposefully causing a ship to wreck in order to loot its treasure. One hundred years later, the ghosts of the dead return to extract revenge on the town. 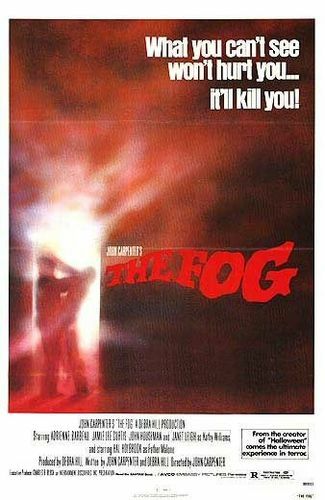 Now granted, in the age of CGI computer effects, the special effects of The Fog certainly look dated, but I would argue they still retain a wonderful charm. This movie works for me, and for this category, because not only is the movie about ghosts coming into a town and killing, but because it is setup like a classic ghost story. The structure of the plot is similar to something that friends would tell each other while sitting around a campfire late at night, or something kids tell each other while camping out with flashlights in the backyard. In fact, the opening scene of the film involves just that… a character providing background to the story by telling the ghost story to a group of kids around a campfire. This is certainly a fun and creepy movie to checkout. As a bonus, the premise of the movie of a town purposefully causing a ship to wreck is based on a true story. With the spirit of Halloween upon us, it was all too easy to pick something like Halloween, Psycho, or any of the Friday the 13th films for this category. While I enjoy those films for various reasons, American Psycho’s intensity allows it to claim the spot. The film was released in 2000 and features Christian Bale in the lead role. Mary Harron directed the film. It is based off the 1991 novel of the same name by Bret Easton Ellis. First, the violence is amped up to horrific levels. The film involves Patrick killing his victims in all sorts of grizzly manners, all while ensuring that he does not get blood stains on his expensive suits. Patrick is also rather vile, as his nights with various prostitutes turn into something akin to a disturbing nightmare. Consider this a fair warning, the movie is very graphic and depicts violence against women, men, and if memory serves me right, a suggested killing of an animal. The counterpoint to the violence however is the second factor, which is that the movie is a very dark comedy. Despite the violent nature of Bale’s character, his obsession with appearance and the meaning of various 1980s pop acts gives his character an over-the-top quality, where you the viewer find him almost quirky. 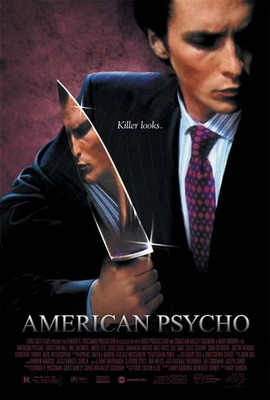 Without giving away too much of the movie, an iconic scene involves Bateman hacking a person to death with an ax while listening to Huey Lewis and the News’ “Hip to Be Square.” This murder comes after a diatribe about the band and how their early work was “a little too New Wave” for Bateman’s taste. As funny and horrifying as the film is, the book amps up both factors even further. I would recommend the book, but it is very disturbing. This is certainly not a light read for the beach (unless you’re like me). The book also accomplishes much more of a satire on 1980s culture, a feature that is somewhat lost in the film. This one is definitely worth a look, but again, it is a very disturbing movie. Check out the trailer for it below. **WARNING** The trailer itself is not for the faint of heart. As you may have noticed with my movie postings thus far, I tend to favor older films. For the horror genre, this is especially true with Vampire films as, let’s face it, vampires are no longer scary in movies thanks in large part to the Twilight series. Sure, you have recent films like the remake of Fright Night, but if I have not explicitly stated it before, you can likely guess my feelings regarding film remakes. First, it is set in the middle of winter outside Stockholm. The snowy and dark outside enhance the mood and give the viewer a different environment for the vampire tale. Gone is the gothic architecture and castles and instead you have dark snow, woods, and an apartment complex. Secondly, the two main characters are children, who happen to be amazing actors. Their performance genuinely draws you in and makes the film that much more believable. There is an element of bullying in the plot that adds to the realism, as well as a budding romance between the two main characters. Additionally, in terms of vampire lore (how they can be killed, what is harmful to them, etc. ), this film holds close to that mythos and treats vampirism like a disease. An American remake came out shortly after, entitled Let Me In. I have not seen this version and though I generally despise remakes and reboots (perhaps in another post I will rant about that), the American version seems to get positive reviews. This is in sharp contrast to the 2005 remake of The Fog, which currently holds a 3.5 on IMDB. To end this year’s “Fall and Film” series with a vampire film whilst NOT discussing Dracula would be a crime. 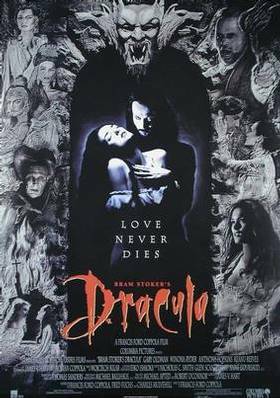 With the various versions of Dracula that exist, from the early silent Nosferatu to the recent Dracula 3D by Dario Argento, the famous count has enjoyed his fair share of film adaptations. This choice was close, because I absolutely love the 1931 version with Bela Lugosi. However, Coppola’s 1992 version was one of the first horror and R-rated films I saw as a kid, thus adding a nostalgia factor for me. Beyond that though, the film itself is very good. Also, of the various versions, this one follows the original novel by Bram Stoker the closest. The special effects, the casting, and the overall flow of the film are excellent. The overall look of the film is excellent and one that I would recommend during the season. That concludes my “Fall and Film” series. For those who read all three parts, I certainly hope you enjoyed my brief take on these films and will find the time to check them out this Halloween season. No matter how stressful things get in life, it is always good to sit in front of the TV with a cold beverage, a hot bowl of buttery popcorn, with the lights off, and enjoy a good scary story. I know it is early, but Happy Halloween and thank you again for reading. This entry was posted in Movies and tagged American Psycho, Christian Bale, Dracula, Halloween, Horror Films, Let The Right One In, Patrick Bateman, The Fog. Bookmark the permalink. Got a nice little blog here, love it…consider it followed :).